In the last couple of weeks I was on a vacation and can tell you this vacation was the best in the last ten years :) Now I’m ready for the new challenges! In this blog post I would like to show how to convert single VMware virtual disk (.VMDK) to Hyper-V (.VHDX) with free tool, Microsoft Virtual Machine Converter 2.0 (MVMC) which you can download from here. Few months ago I wrote blog post on similar topic, but this is a new version of MVMC with lots of new features. 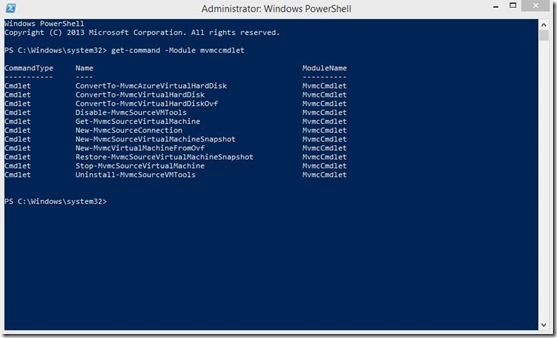 What is Microsoft Virtual Machine Converter (MVMC)? Microsoft® Virtual Machine Converter (MVMC) is a Microsoft-supported, stand-alone solution for the information technology (IT) pro or solution provider who want to convert virtual machines and disks from VMware hosts to Hyper-V® hosts and Windows Azure™. 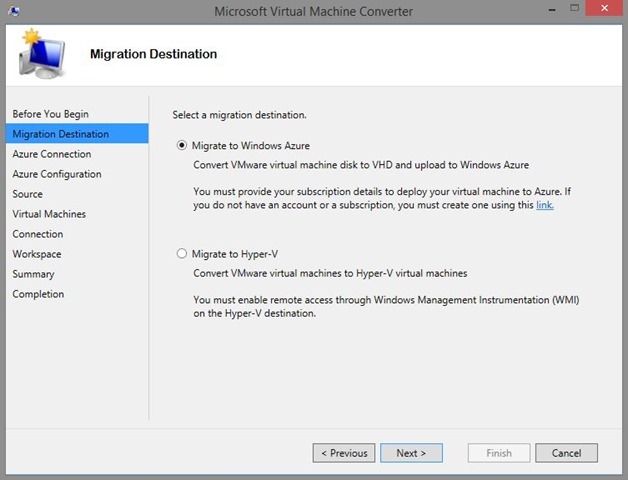 As you noticed, with Microsoft Virtual Machine Converter we can convert / migrate to Azure and to Hyper-V but only based VMs only if have vCenter server or ESXi server, but what if I have VMware Workstation based VMs.. cannot convert with MVMC. 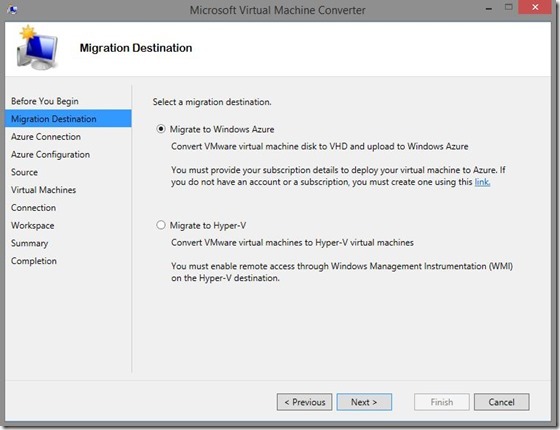 On that way can convert only .vmdk to .vhdx and then create new Hyper-V VM with converted virtual disk. With PowerShell, of course :) In the previous version of MVMC we could do with CLI. At the end we can create Hyper-V virtual machine with converted virtual disk. I’d like to thanks my great friend Aleksandar “The PowerShell Guru” Nikolic for the big help. Also, I must mention a new book “System Center 2012 R2 Virtual Machine Manager Cookbook – Second Edition” from my Hyper-V MVP fellow Alessandro Cardoso. MVMC 3.0 is what’s available now. I’m not getting those commands list. I followed the Create User profile instructions, but I don’t see “C:\Program Files\WindowsPowerShell\Modules” and also it didn’t work anyways. After this conversion finished successfully. Where can we download Microsoft Virtual Machine Converter 2.0 from now..?, everywhere points you to v3..
I’ll put on the OneDrive in the next couple of days. Hi Romeo, odd request, but do you happen to have the mvmc_setup.exe for MVMC 2.1 available yet? Microsoft has removed it from their download site and I’m unable to locate it. We’ve run into an issue with MVMC 3.0 where it cannot convert VMware to Hyper-V VM’s with more than 1 disk (most of ours). Appears to be some sort of bug. have you MVMC version 1.0 ? I researching too the MVMC in version 2.0 , could you send me yor onedrive link, please. Here is a link http://1drv.ms/1u6pgag where you can download MVMC 2.0. Hope this will help. Hi Romeo, did you have any luck in finding MVMC 2.1 install? Much appreciated. Hi there, I converted the vmdk file to vhdx but now the Hyper V VM does not boot… Any solution? 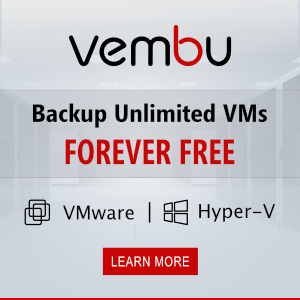 Did you remove all Checkpoints from converted VM? What OS you have on the converted VM? Can you comment on MVMC 3.0’s compatibility with ESXi 6.0? I have used this command line in PowerShell and the problem I have come across is a 6.8gb VMDK file was converting however at approximately 2.88gb of creation the process seems to have stalled. I have been waiting for about 15-20 minutes and it hasn’t progressed. Also the PowerShell line is still at the blinking cursor “_” under the command I ran.. so it looks like it is still going however nothing seems to be happening. Any suggestions? Thanks! am getting following error, pls suggest. ConvertTo-MvmcVirtualHardDisk : One or more errors occurred. 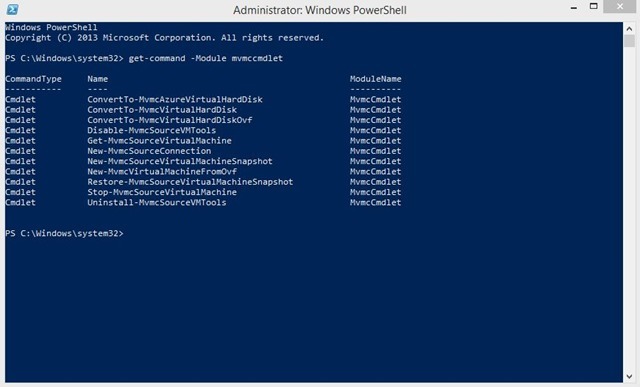 Note that if you have Windows Server 2012 R2 installed, you need to install the feature .NET Framwork 3.5 Features first, else the Powershell commands even in MVMC 3.0 will not work.